When the caddis hatch the emergent adult tries to swim as fast as it can to the safety of the bank. In this mad dash for survival it creates a 'V' shaped wake a bit like a small speed boat. The trout are on the look out for this give away sign of fast food on the move and home in on these flies with some spectacular takes. This pattern was designed by Al Troth in Pennsylvania, USA in the 1950's, to imitate the adult caddis in two ways: firstly by copying the shape of the wings and secondly he made sure the blunt stubby wings caused a disturbance on the retrieve, in the water surface that mimics that caused by the scuttering adults. 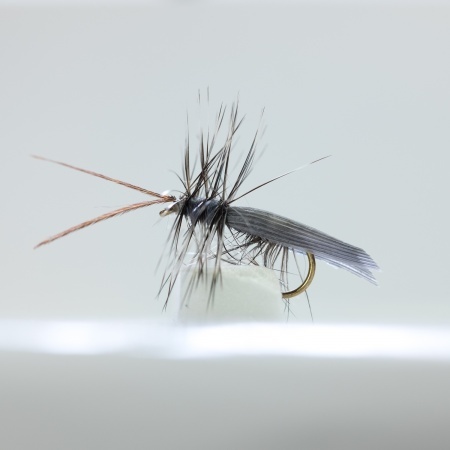 Al Troth used a typical roof wing profile to mimic a whole range of medium to small caddis flies rather than try to imitate a particular species. Al Troth later moved to Montana where he gained fame as a fly tyer and trout guide. 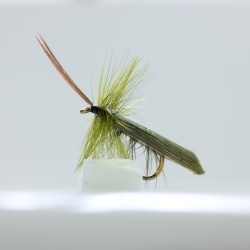 His new Elk Hair Caddis Dry flies soon became widely used in the various trout rivers of the Rockie Mountains. It is now used all over the world. The common or slang term ‘sedge’ originates from the fact that adult Caddis flies can often be found clinging to sedge grass near the waters. Sedge/Caddis flies have four wings. The forward pair are normally a little longer than those at the rear. At rest their wings lie close along the body in an inverted V shape. Caddis flies do not have tails but many have long antenna. The Latin name for this group of flies is ‘Trichoptera’.